In the Thinking Theologically Conference (TTC) that concluded a month ago, we caught up with husband and wife duo, Joshua Hooi and Leong Mei Yee, who returned from TTC a little more convicted on the idea of a local church. Here, they relate their first TTC experience with our resident reporter, sharing how the conference renewed their understanding of the church and realign their perspective. 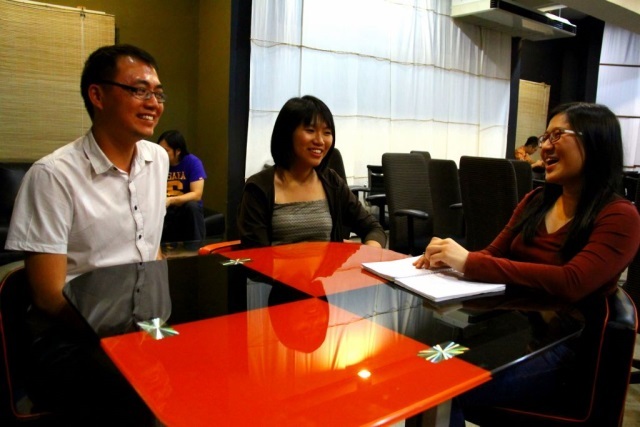 From left: Joshua Hooi, Leong Mei Yee and the interviewer. CERC: What did you think about the content covered in TTC? Joshua: The content was thorough. To me, what stood out was how much the content meant to me and changed my attitude towards church. Before this, I was going through a period in life where church is just something I "do". I know it is not healthy and I know it in my head that church is important. But through TTC, my understanding of church became clearer as we went through a series of questions, struggled with the bible studies, read the text and answered questions before going into the talks at night. All these really helped me change my attitude towards church. Mei Yee(MY): I appreciate the fact that they covered topics like "Knowing the Kingdom of God" and "Understanding the Church". The content was massive. I don't know how much I managed to cram into myself. But at the end of the day, it was thoroughly done. I can see the flow of how it is worked out from the discussion sessions in the morning to the night talks. Was there anything that you found difficult to grasp? MY: I find it difficult to take it forward to application after knowing so much. I feel that I should be able to apply it. My struggle was at the part about loving His church and commitment issues. My family doesn't have good experience with churches in the past. Hence, I've always kept the church at arm's length. I treated the church as something I need to do or attend because I'm a Christian. But through TTC, God showed me how important the church is to Him and how important it should be for me as well. I find it hard to love the church like the family of God but I will try my best. How else have you benefited? J: It refreshed my understanding of Christ being the head of the Church. Christ thinks the church is important, and I am part of that church. Therefore, if I think church is not important, I'm actually saying that I don't love Christ. The other thing I took home from TTC was what the bible says about loving my brother. It says that if you don't love your brother, then the love of God is not in him. In a way, you're not really Christian then. So, going back to where I came from and the struggles I had going through during certain phases in life, I felt that I was really wrong. How can I say things like "the church is just something I go to", "I don't have to love God's people" or "God's people are so unloving, why should I bother anymore"? As for the invisible church, to me it was like a secret. I understood it so it doesn't matter what I do. That perception was kicked away during TTC. I learned that the local church is still very important. I knew it in my head, but TTC really drove it home and changed my attitude. Would you go again for TTC and who will you recommend? J: I would. I would recommend it to my brothers and sisters whom I've known for many years from my church background. I feel that our understanding and attention for word of God has to be rekindled again. I don't know any other better way to do it than to get serious with it. We have camps all the time, but camps do not always address questions like this. TTC is a focused and objective driven conference. So, if I want to bring my friends to somewhere where these questions will be answered and issues resolved, TTC is a good place to go to. MY: Any Christian from any denomination will benefit from attending TTC.